Niang outsprinted goalkeeper Wojciech Szczesny to reach the ball about 40 yards from the net, knocked the ball forward and tapped it in for Senegal's second fluky goal of the night. The Lions of Teranga held on for a 2-1 win over Poland and opened the World Cup with a surprising victory — just like in 2002. After Niang doubled the lead in the 60th, Krychowiak headed in Kamil Grosicki's free kickin the 86th minute, ending a streak of five straight scoreless openers for Poland. 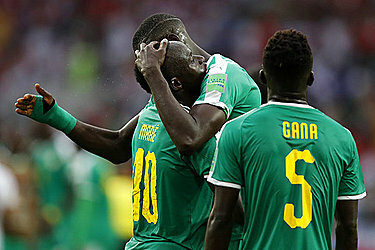 Senegal President Macky Sall was in the stands to watch the world's 27th-ranked team upset the eighth-ranked nation — and bring up memories of the 1-0 win over defending champion France 16 years ago.